The PFD-32x24-RGBA Pathfinder RGBHV & Stereo Audio Matrix Switcher from FSR is designed to offer 32 inputs and 24 outputs of matrix switching capability for RGBHV and stereo audio signals. It is well suited for use in video & control rooms, educational institutions, government offices, and houses of worship, among many other possible settings and applications. The unit offers high bandwidth capacity to accommodate signals without degradation of clarity or color fidelity. It features split-mode switching to allow each channel to be switched independently. The chassis has been optimized to maximize functionality while minimizing its footprint and the space it occupies in your rack or work area. The unit can be controlled via a set of ASCII commands using its RS-232 or IP connectivity. This matrix switcher is well suited for use in video & control rooms, educational institutions, government offices, and houses of worship, among many other possible settings and applications. 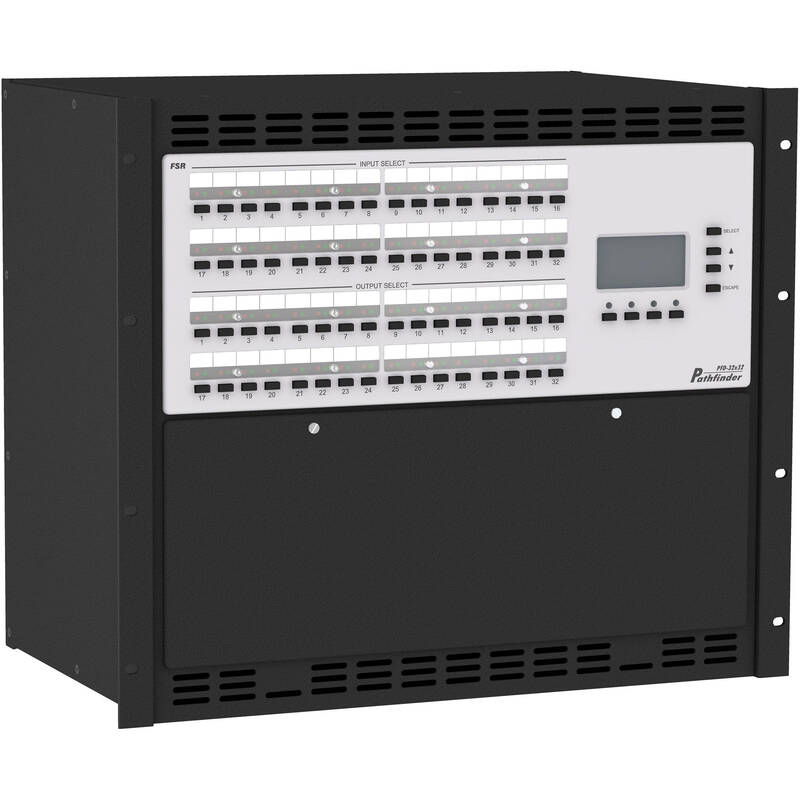 This unit is designed to provide 32x24 matrix switching of RGBHV and stereo audio signals. Stereo audio support provides balanced and unbalanced stereo audio switching with independent input trim control and output volume control. Independentinput gain switches allow unity or +14dB gain settings for each input to maintain optimal signal-to-noise ratio. It features greater than 600MHz @ -3dB bandwidth with +/- 1.0dB flatness to300MHz. Split-mode switching allows each channel to be switched independently, thereby permitting one physical matrix switcher to perform the duties of several units and ensuring that the switching capabilities are present as video types and resolutions are upgraded in the future. Chassis size is optimized based on matrix size and video type to save as much space as possible in your rack or work area. The Pathfinder uses an ASCII command set that gives control systems complete access to all functions. Each unit is equipped with an RS-232 serial port and an IP port. It features a genlock input. User-customized protected button labels can be used to personalize use of the switcher.